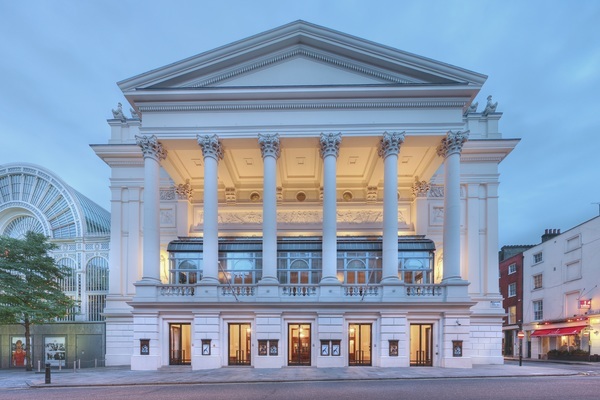 The Royal Opera House opens its refurbished Front of House and Linbury Theatre, a scheme by architects Stanton Williams, part of "Open Up", a project creating a more welcoming experience. No access to main auditorium or backstage. Actor-manager John Rich built the first Theatre Royal, Covent Garden with the fortune he had made from the huge success of The Beggar’s Opera. At that time, under the terms of a Royal Patent, Covent Garden was only one of two theatres permitted to perform drama in the capital. The other patent theatre was the nearby Theatre Royal Drury Lane, and a keen rivalry soon developed between the venues. The first important musical works to be heard at the theatre were by Handel, who, from 1735 until his death in 1759, had close links with Covent Garden both as composer and organist. Many of his operas and oratorios, including Alcina and Semele, were first performed there, and he bequeathed his theatre organ to John Rich. Extensive rebuilding work took place in 1787 and 1792, but in 1808 the theatre was completely destroyed by fire, with the loss of twenty-three fireman as the building collapsed. On 5 March 1856 disaster struck again: for the second time the theatre was completely destroyed by fire. Work on the third and present theatre eventually started in 1857 to designs by E.M. Barry and the new building opened in May 1858 with a performance of Meyerbeer’s Les Huguenots. Barry also designed the striking glass and iron Floral Hall, intended as a flower market but also hosting the occasional ball. In 1892, with the repertoire broadening, the theatre was renamed the Royal Opera House. Winter and summer seasons of opera and ballet were given and between seasons the theatre was either closed or used for film shows, dancing, cabaret and lectures. During the Great War the theatre became a furniture repository and during the Second World War a Mecca Dance Hall. That’s how it might have remained if the music publishers Boosey and Hawkes hadn’t acquired the lease. David Webster was appointed General Administrator and the Sadler’s Wells Ballet, under Ninette de Valois, was invited to become the resident ballet company. The Opera House reopened on 20 February 1946 with a gala performance of The Sleeping Beauty with Margot Fonteyn as Aurora. With no suitable opera company able to take up residence, Webster and music director Karl Rankl began to build a company from scratch. In December 1946 Covent Garden Opera teamed up with the ballet in a production of Purcell’s The Fairy Queen choreographed by Frederick Ashton; the following January saw the company’s first performance of Carmen. Both companies were eventually awarded Royal Charters: the Royal Ballet in 1956, the Royal Opera in 1968. 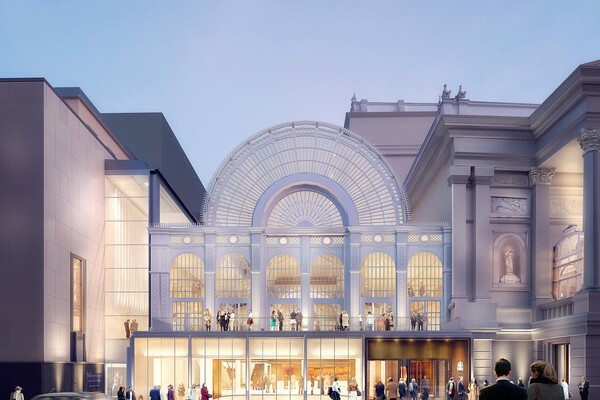 By the 1980s it was pretty clear that the facilities at The Royal Opera House were inadequate for carrying the two companies forward into the 21st century. Plans for a major development of the theatre were revealed in 1984, with the architect Jeremy Dixon, in collaboration with Bill Jack of Building Design Partnership (BDP), winning the competition to design the project. However, it was only after the creation of the National Lottery that the Opera House was awarded £58.5m towards re-building costs. Work started in 1996 with a farewell gala taking place in the ‘old’ house in July 1997. Three years later, at total cost of £178m, the theatre had been utterly transformed. Brand new technical and rehearsal facilities were built; a smaller auditorium, the Linbury Studio, was created for smaller and more experimental productions, while the existing auditorium and foyers were fully refurbished. As well as all this, the virtually derelict Floral Hall was completely rebuilt and turned into a thrilling public arena, with bars and eating spaces in spectacular surroundings. Above all, the creation of new spaces has integrated the theatre more fully into its surrounding environment and made visiting a far more enjoyable experience. 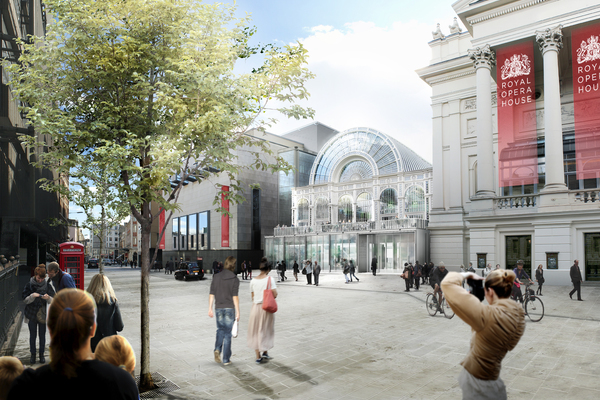 The Open Up project designed by architects Stanton Williams aims to enhance the experience of coming to the Royal Opera House, for audiences, artists and guest companies. A new public programme of learning and engagement events targeted at a wide range of people, a new espresso bar, improved facilities, an enlarged retail space and a fully refurbished Linbury Theatre all make up the plan to encourage visitors to spend more time in the building.